I am participating in Leslie Saeta’s annual “30 in 30” painting challenge this month. This is my painting for day 17. It’s sweet to study the buildings in an old small town where they rarely rise above four stories tall. I like to look at rooftops and caught this view while walking down a hill until I was at just rooftop level at just the right time of day, late afternoon, as the sun was nearing the horizon and the light became golden and touched just the tops of the buildings with shadows cast by other buildings. This is seen from the backs of the buildings, and all red brick, almost a monochromatic color scheme. I managed to capture the sun glinting off the blue dome and crosses of the Russian Orthodox church but couldn’t line up the gilded dome and crosses of the Ukrainian Orthodox church right next door. No matter where you look in this town you see crosses against the sky because there is a church on practically every corner, but none as fine as the Orthodox churches standing almost side by side. 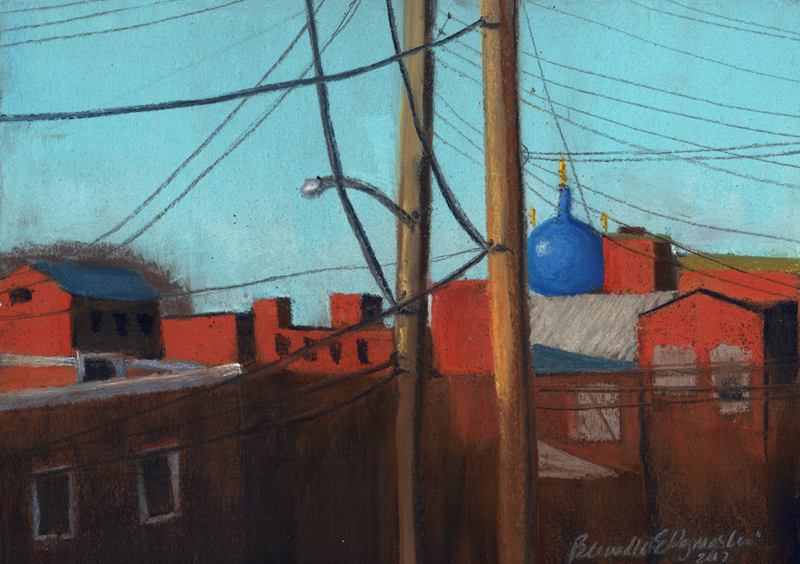 This entry was posted in 30 in 30, original artwork, pastel and tagged 30 in 30, 30 paintings in 30 days, pastel painting, pastel painting of buildings, small towm pastel artwork on January 18, 2017 by Bernadette.